This New Year 2017 marks the fiftieth anniversary of Asian Access mission founded in 1967 by K&J. Attracted by the creative, entrepreneurial, pioneering vision and commitment to close partnership with Japanese Christians, I joined the mission in 1975 and will be celebrating my forty-second year on the field in Japan. Reflecting the expansion of the mission, there were meaningful name changes from Language Institute for Evangelism to LIFE Ministries to Asian Access to Asian Access/SIM. I’ve followed the development of the mission in what has been a most rewarding and fruitful career filled with lots of challenges and lots of blessings. 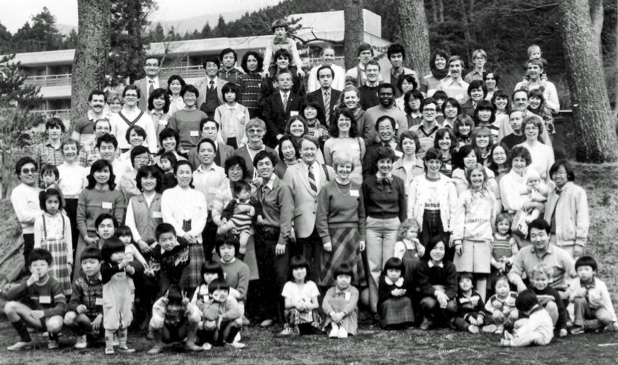 The photo above taken of our mission family in 1983 is full of people with wonderful stories of God’s work in their lives as they were part of our history. The first Sunday following my arrival in Japan I met single, young Christian Nobuo Abe at one of our mission’s partnering churches I attended that day. I also met his future bride Keiko, who became a very helpful friend in practical ways as I was on a steep cross-cultural learning curve to function and flourish in Japan. Shortly thereafter Nobuo and Keiko married and went on to partner closely in our church planting ministry outreach programs, especially Scrum Dendo (teamwork evangelism) that was my primary ministry during the 1980’s. Pictured in the first row, right hand corner of the photo above is Nobuo and his first-born son, who grew up and is now partnering in a church plant with one of our A2 missionary families. Last September at the 6th Japan Congress on Evangelism I met the Abe family again and was encouraged to hear about their ongoing ministry. Not only do we celebrate our history, but it provides a springboard to move ahead and expand in the 2017 year world stage and beyond. This spring our mission family, now enlarged to a growing number of countries in Asia, will gather in Jakarta, Indonesia for an official celebration of our past, an assessment of our present and projections for our future. Meanwhile, I continue to focus on evangelizing and making disciples of Jesus through small group Bible studies in my home, in the community and in the church setting. May there be many more stories such as the Abe family. Thank you for your prayers and partnership over the years that has facilitated this outreach.